This past year, the Facility Builders & Erectors, Inc. crew made significant headway on a fun and innovative commercial project in the Los Angeles area. The team did a masterful job working with the architect team and successfully interpreting their vision to become this next generation of building design. One of the elements that makes this particular project an exceptionally distinct design are the multitude of bi-fold and roll-up doors found around the entirety of the building. Even more unique, this structure features two full sets of bi-fold roof doors. 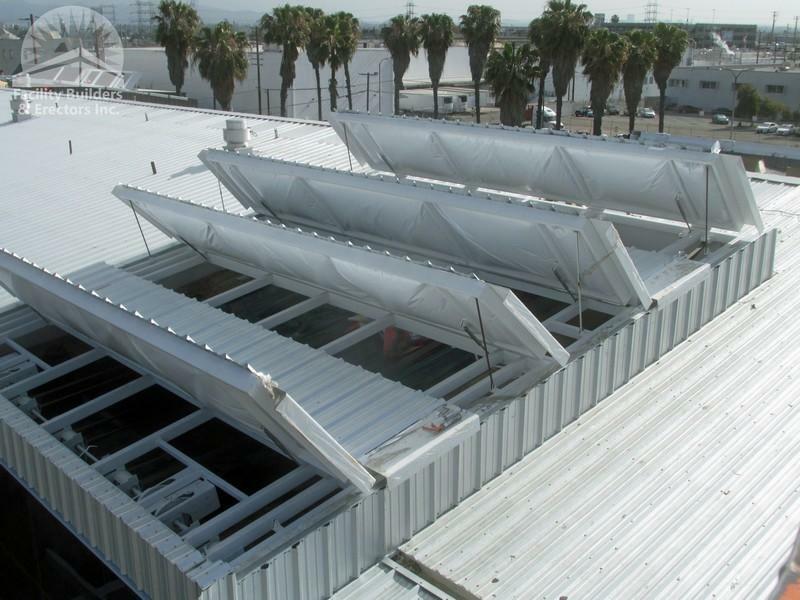 These roof openings will not only let light in on sunny days but will also function like a fully insulated roof when closed during a rare Southern California cold spell. Typical bi-fold doors are known for sliding fully open and having their panels stack and fold unobtrusively into the far walls to produce an open space area that creates a seamless flow from indoors to outdoors. These particular types of bi-fold doors are most often found in two different settings - either in homes as a way to present family, friends or guests into a backyard patio setting or at restaurants and bars as a way of opening up to other sections for patrons to enjoy. In this Los Angeles building, the bi-fold doors do not just open up one room to another, these roof bi-folds open up the ceiling in two different locations, giving the impression of an even larger area. Each of these bi-fold roof doors have sets of sturdy glass directly beneath them, allowing any future occupants a chance to see both rainy day scenes or cloudless blue sky vistas. 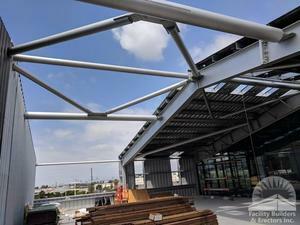 These roof panels will be accessible by the building management to feature the beauty that are most sunny, Southern California days. Another great architectural characteristic of this particular building project will be its open, no roof area within the building. 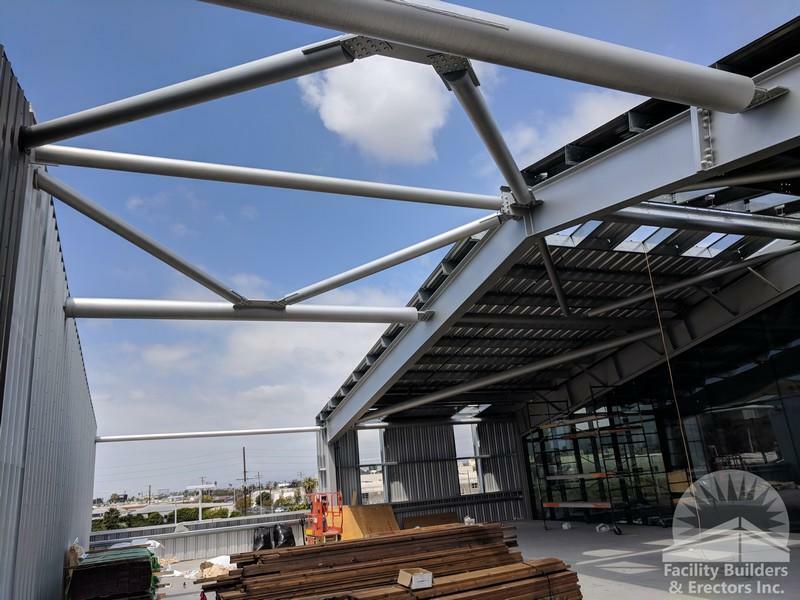 This will be a place where future employees can enjoy fresh air on a break, brainstorm while taking in the fantastic Southern California weather or even bring potential clients and business partners out on the mezzanine level in the middle of a busy, hustling city! When completed, this area will be furnished with a grassed in area for not only the humans in the building, but for any four legged friends that the company may allow in to work with them. Along with these two very special features, the architects have also found ways to open up even more of the building for natural light purposes that can be combined with artificial lights in and out of work spaces. With a myriad of different shapes, styles and sets of windows throughout the building, the architects have found ways to bring the outside indoors. Traditional 'open office' design concepts typically only ever apply to the interior of an office. Whether that means workplaces with all glass walls, open seating concepts, getting rid of any traditional cubicle setting or even breaking down non-load bearing walls. However, these architects have found a way to incorporate those ideas and then expand on a more traditional open office design concept, turning it into its own entity. With glass walls around every office, open areas to congregate and natural lighting this open office design concept will assist and inspire its future inhabitants to collaborate, discuss, motivate, debate and ultimately stimulate creativity. The future employees will have a multitude of options when choosing to have meetings to further foster any innovative ideas.